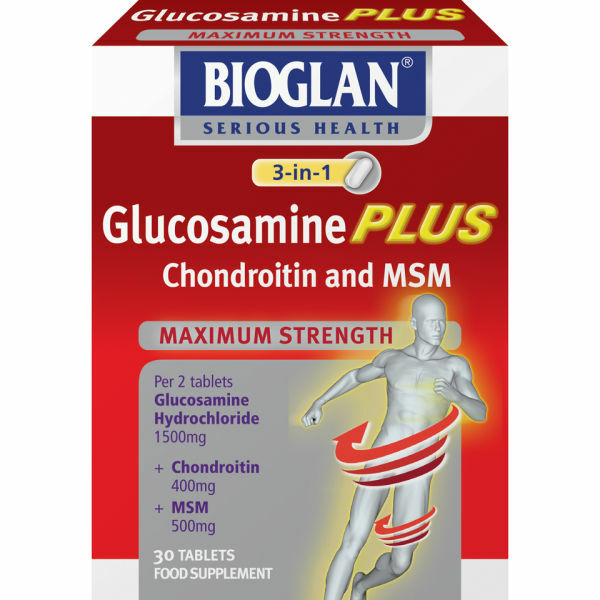 The Bioglan Glucosamine Plus Tablets provide 1500mg of Glucosamine Hydrochloride, supported by Chondroitin & MSM. Each of these three components are crucial building blocks of Glycosaminoglycans, which are the key structural component of cartilage and connective tissues. With age, the body's ability to produce and store these nutrients reduces, so this health supplement helps to replenish levels within the body, helping you to stay active. - L.M. Glucosamine Plus unique formula contains: Glucosamine Hydrochloride, Methylsulfonylmethane, Anti-caking Agent: Calcium Hydrogen Phosphate, Chondroitin Sulphate, Binder: Microcrystalline Cellulose & Hydrogenated Vegetable oil & Colloidal Anhydrous Silica, Disintegrant: Croscarmellose Sodium, Filler: Povidone, Tablet Coating (Hypromellose, Titanium Dioxide, Macrogol, Carnuba Wax).